There is so much to love about a good biscotti recipe: that super crispy exterior, combined with a slightly tender center, the taste of nuts and vanilla, the assurance that your cookie is sturdy enough to be packed up and shipped to friends or family or dunked into a cup of black coffee. Biscotti have always been one of my favorite holiday treats (anytime treats, really), and this year, I thought I’d share a super simple, vegan cranberry almond biscotti recipe, one that can be modified to use different types of nuts and dried fruits depending on the season and what you’re in the mood for. On first inspection biscotti always seem to me like a lot of work–the whole baking twice thing–but when I made this batch I was actually reminded that they’re so much more low-key than a lot of other holiday cookies. There’s no rolling, no shaping, no sprinkling, no piping. 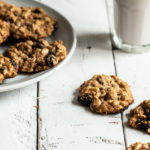 The toughest part of getting the recipe right is to carefully slice the cookies from the log you’ve made when it’s time to bake them for the second time. A good serrated knife makes really easy work of this. 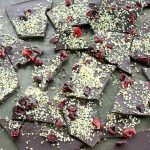 For me, any treat with cranberries screams “Christmas!”, and I love how the cranberries pair with almonds in this recipe. If you’d like to, you can use chopped, dried figs, raisins, chopped apricots, currants, or another fruit of choice in the recipe. You can also use toasted hazelnuts, pine nuts, or pistachios in place of the almonds. I think the almond extract makes a big difference, and it’s a worthy ingredient to have for other baking projects, but you can use 1 1/2 teaspoons vanilla extract instead if you don’t have it. Finally, I couldn’t resist adding of orange flavor to the biscotti, especially since it plays so nicely with both cranberries and almonds. 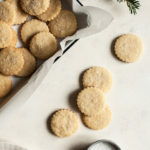 The citrus zest and juice really do make the cookies more flavorful, and I’m happy I added it to the recipe at the last moment! In an electric mixer fitted with the paddle attachment, beat together the orange zest, sugar, and buttery spread on medium speed, until the mixture is light and fluffy. Add the aquafaba or flax egg and the two extracts; beat for one more minute. Turn the speed of the mixer to low, then add half of the flour mixture. When the flour is fully incorporated, add the orange juice to the mixer and beat until it’s incorporated. Add the rest of the flour mixture, the cranberries, and the almonds. Beat until until the dough is evenly mixed and forming large clumps. Cover and refrigerate the dough for at least 30 minutes (and up to 2 hours). Preheat the oven to 325F and line a baking sheet with parchment. Divide the dough into two evenly sized pieces and shape each of them into a log that’s about 8 inches long, 1 inch high, and 3 inches wide, spacing the logs a few inches apart on your baking sheet. Bake the logs for 30-35 minutes, or until golden and firm to the touch. Raise the oven heat to 350F. Remove the logs from the oven and allow them to cool for 15 minutes. Use a serrated knife to cut the logs into slices that are about ½-3/4 inch thick. Arrange the slices on your cookie sheet cut side up, then transfer them back to the oven. Bake for 11-13 minutes, or until the biscotti are golden brown. Transfer them to a cooling rack and cool completely before serving. Biscotti can be stored in an airtight container for up to 6 days. *To create a flax egg, whisk together 1 tablespoon ground flax meal and 3 tablespoons warm water and allow the mixture to thicken before using. I think a cup of coffee is as essential to the enjoyment of biscotti as a glass of milk is to sugar cookies, but of course the biscotti are perfectly tasty on their own. One thing I love about biscotti is that they’re light and crispy and not overly sweet, which makes them a pretty reasonable snack or afternoon treat. I was hoping to have a little more to say in this post–my last before the Christmas holiday this week–but I’m feeling short on words today. Fortunately, festive treats have a lot to say on their own. I hope you’ll enjoy these cookies, friends, and I’ll be back for a holiday weekend reading post on Sunday. Look good. Will try to do today. Thanks for your sharing! Cranberries and orange and almond sound like a fantastic combination. I’m going to have to add these to the Christmas cookie list. What’s the name of that thing you have them resting on? A crisper? Toaster? My mom had one of those I’d live to get one. Please answer if you can thank you!! Is there any other way to extend the storage time? Looks crunchy and yummy. Will definitely try it. Perfect recipe! Tried them yesterday with some coffee and YUM! Hey Morgan! Do you have a handheld mixer? I think you can do it by hand, and the results will probably taste yummy, but the texture may not be as consistent as the mixer version. If you try it, let me know! These look delicious! I’m not a vegan but I’ve always wanted to try to become one. I am afraid that the lifestyle change will be too much for me to handle. I have never cooked vegan food before, can anyone tell me if vegan food or ingredients is more expensive than regular non-vegan food or ingredients? Orange, cranberry and almond sounds like such an amazing combo. Never tried making biscotti before though – wish me luck!! Thanks for the great recipe! Looking forward to checking out the rest of yours. Perfect recipe for the holidays. My vegan friends will love it when they visit. I’m into healthy foods but haven’t gone so far as to go vegan. Still, these would be yummy no matter your preferred diet. Thanks! At first, I would like to thanks for sharing these ingredients of vegan cranberry biscotti. Really These are delicious and amazing. I tried at my home last 2 months ago but your recipe is better than from mine.